Which are the most common and frequent crimes in the state of California? Do the crimes represented in the news every day the most frequent ones? In news, we encounter crimes like murders, theft, sexual assaults. But the reality is something else. Sometimes the news station gives off the wrong misconception about what the common crimes are. In the news station, you only see reportings of the most violent or disruptive crimes. You will see things like murders, high-speed pursuits, and high-profile robberies. The reality is those are not the common crimes that occur in the state of California. There are two different types of crimes here in the state of California. Crimes are classified into two distinct categories, felonies, and misdemeanors. Felonies are the more severe types of crimes such as robbery and murder, while misdemeanors are the less severe crimes such as public intoxication. 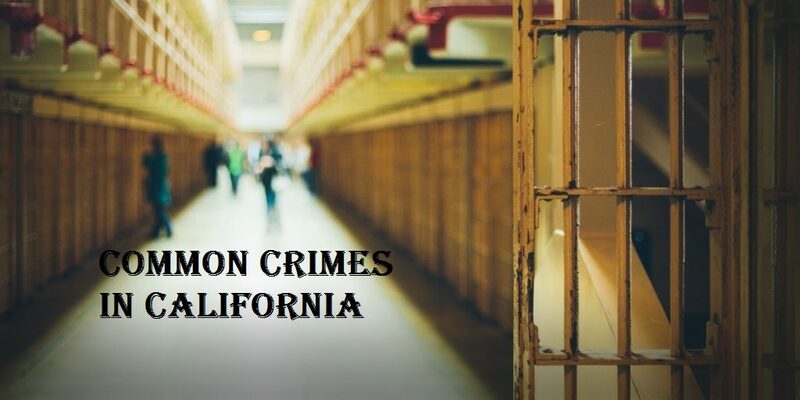 Whether you are curious about the 6 most common crimes in California, or you are facing charges, allow Avolevan Bail Bonds to explain to you the 6 most common crimes in California. If you are possessing a drug or related thing which is illegal, then it is a crime. Being in possession of an illegal substance, drug, paraphernalia, or a prescription drug without the prescription can be either a misdemeanor or felony depending on the drag and amount found. Recently marijuana became legalized in the state of California; however, there are rules and regulations you have to follow. The crime is judged based on the type and quantity of the drug. You will also be charged if you are an unauthorized seller of an illegal substance or drug found in large quantity with you. Penalties will be imposed based on the type of drug possessed by the offender. Bail Amount – Drug possession charges usually start with bail amounts set at $20,000 and can go up to $100,000+ depending the amount and what kind of drug is found in your possession. There are different kind of charges related to weapons. Some include possessing an illegal weapon or being a person who is prohibited from having weapons. Illegal possession of a weapon is a serious offense in the state of California but it is in the list of most serious crimes committed in the state of California. This crime is punishable by law with an imprisonment term of more than one year. Petty theft often is just a misdemeanor and can result on a release on your recognizance if the amount stolen is less than $950. But if you stole an item or multiple items that total over $950, you will be arrested facing felony charges. Bail amounts for such thefts are usually set at $20,000. Shoplifting is considered as a minor crime but repeated such acts is a serious crime. Private property or residence burglary bail amounts usually start at $50,000. Forgery, identity theft, stealing property, robbery falls under the theft offenses. The theft offense is charged on the basis of the value of the property stolen. However, if you obtain other charges while at the crime scene such as an assault etc., the charges will add up and the bail amounts could stack, and as a result, the bail amount could be set higher. Bail Amount – For serious theft offense, the bail amount can extend to $50000 or even higher. Driving under the influence of drugs or alcohol is illegal in California. That also includes marijuana even after recent legalization of it. In the state of California, you do not have to pass a drug or breathalyzer test to be considered under the influence. Police can charge you based on being too impaired to drive based on the police officer’s discretion. The penalties are imposed depending upon the amount of drug consumed or any loss of property done by the accused while driving under the influence of drugs. Most counties in Southern California, a first time DUI charge usually results in a $5,000 bail. Repeat offenders are likely to face high bail amounts. Driving under the influence and causing injury to yourself or someone else is commonly known as DUI with Injury. Injury can be to either yourself self-being or injury to another person. Local police define injury as something as little as a scratch to yourself or someone else. DUI with injury is a felony offense and in most of California, carries a bail amount of $100,000. Bail Amount – The bail amount for the first time offense of DUI starts from $5000. Getting arrested for assault could be something as simple as a fist fight, or something more serious involving weapons. An assault is an act committed causing violent injury to someone else. Aggravated assault is usually an assault with a more extensive injury as a result. Anybody found accused of assault will have to face the consequences depending upon how grave the assault was. It is among the list of frequent crimes committed in California. The assault involving the use of firearm is a serious offense. Bail Amount – Depending on the severity of the case, bail amounts for assault typically begin around $25,000 and can go higher depending on the severity and what the police write in the police report. Violation of court orders is considered as a “Contempt of Court” and is punishable by law. The court can take actions against the convict for restraining order violations. Violating a temporary or an emergency protective order that is currently in place could result in bail amounts starting at $15,000 for a first-time offense. Do you need help or have questions regarding these crimes or others not listed above? Call Avolevan Bail Bonds 24 hours a day, 7 days a week. A licensed bail bondsman will answer the phone to help answer your questions. All bail amounts are subject to the judge’s discretion. Many factors are taken into consideration when setting the bail amount of the individual. The more charges you gather, and the longer your criminal record, the higher the bail amount will be. In some cases, the person may not get a bail amount and has to stay in custody until their court date. Not every situation is the same. Each bail amount is set on a case by case basis.